Hi all. Today we are having a first look at Around We Go. As Kryssi mentioned before, there is something about ferris wheels and fireworks that just brings us back and puts a smile on our face. There are a lot of fun elements to this set. 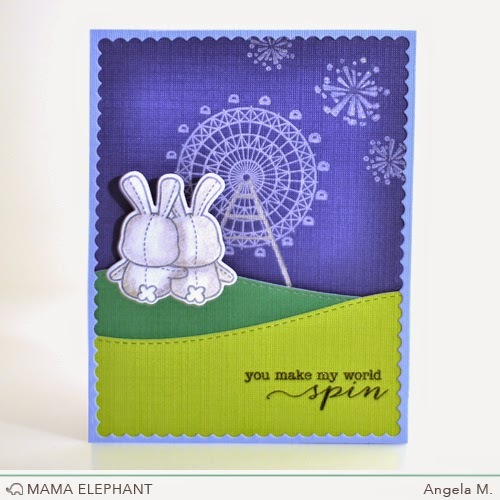 It also comes with a coordinating Creative Cuts die set if you want to give it a spin! My card today is like a scene taken from a movie. It shows two bunnies having a moment while sitting on a hill and watching the fireworks from a distance. The sentiment, "you make my world spin" is nothing less than perfect for this scene! I also used my favorite Wink of Stella pen to add some sparkle to the fireworks to give it more of a dazzle. I'm still working hard on making cards so thanks for looking! Oh loving this card and stamp!! Takes me back to my childhood for sure!! Cute. Love the ferris wheel. Something new. Love this card! It is so precious! Cute little scene, Angela! Well done! Cute card and loving the new stamps. This is adorable - love it!! Oh, this is so sweet! Love! LOVE the ferris wheel!! Your card is adorable! Oh I am LOVING that!!!! Soooo cute.